Today, 13th. May we remember the 25th. Death Anniversary of our beloved master, late Fr.Bede Griffiths. One important thing I remember from his life was his passion for learning. One evening after supper I was passing his room. I saw him through his window and saw that he was reading the periodical the Tablet. He was reading it in such way as if he was eating a delicious dish. I felt jealous. Look at this old man of 82 years who has such a desire to read and I am not even 35 and I have no desire to read. I went to his window and wished him. Come along, his usual expression, invited into his room. After sitting at his feet, he was on his chair, I said, father, I feel jealous of you. He felt uncomfortable and said, why? I replied, you see father, you are 82 years old and you have such a desire to read and I am not even 35 and I have no desire to read. He felt uncomfortable because I told him he was 82. He said, I do not feel that I am 82 but only 18. We just fell into laughter. It was true at 82 he was only 18 and at 35 I was 82. I always remember his passion to learn and to be young always. May we all be inspired by his passion for learning to be always young. Unless you become like little children you cannot enter into the kingdom of God, said Jesus. Fr.Bede was always like a child. May we all become children of the kingdom of God. Peace of Christ is with you. I hope you are all fine. I am pleased to say that my request for a sabbatical year has been granted. Thanks be to God and to all your prayers. 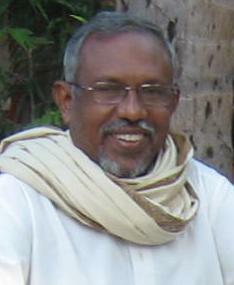 Br.Dorathick RAJAN will be the new Prior. He will take the charge on 9th.April, after his priestly ordination on 6th.April. I probably leave the ashram after 9th. The community of Shantivanam wishes you a happy and Merry Christmas. May the day of Christmas be a day where we say 'yes' to life, 'yes' to growth and ' yes' to love and sharing. May our life be the life of incarnation, which is manifesting eternity in the present. May this life of incarnation bring peace and joy within and in the world outside. Our 'yes' to incarnation will make the angels to appear and sing, ' glory to God in the highest and peace to the people of good will on the earth'. And the community of Shantivanam. 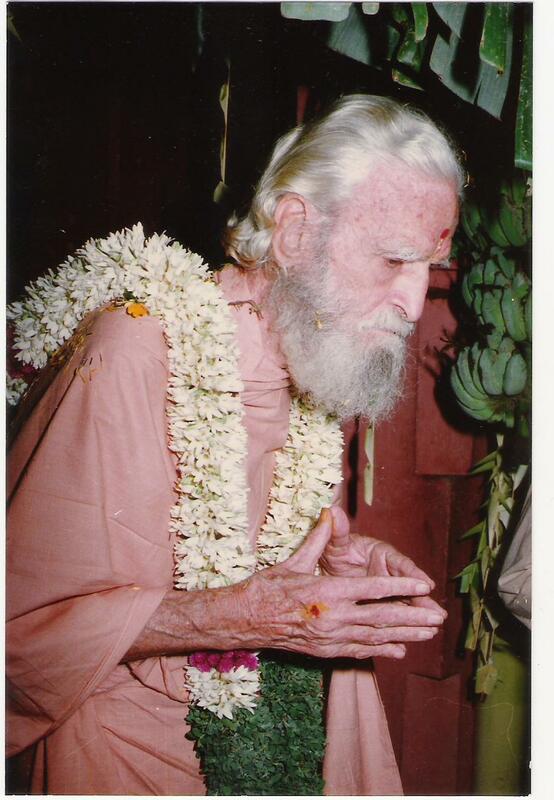 Today 17th December we remember the birth anniversary of our beloved Guruji Bede Griffiths. He was touched by the grace of God at the beginning of his life and he passionately searched to make that seed of grace into a full blossomed flower. We all have experienced that seed of grace in our lives and may the life of Fr. Bede inspire us so that we also search passionately to make that seed of grace into a full blossomed flower. On the 7th December, we remember the 44th Death anniversary of Swami Abhishkthananda. Swami Abhishikthananda together with Fr. Jules Monchanin responded to the call of God for the special need of the time, the inter-religious dialogue. Their call gave birth to the ashram and their generous and courageous response has given reason for our life and mission in the ashram. They passionately searched for Truth that can give birth to unity and peace in the world. In this sense they were like Virgin Mary who responded to the call of God to give birth to the Truth that can break down the wall of division and bring peace in the world. May we all have the same generosity and courage to respond to the call of God for the specific needs of our time. Today 10th.October 2017, we commemorate the 60th death anniversary of Father Jules Monchanin. We are all very grateful to his sacrifice for which we have found reason for our life. His sacrifice was great because he died without seeing his future. Abraham did not want to die without seeing his future, Isaac, but Monchanin did not ask for a son, for a future. He lived for eternity. He accepted what is given for the moment. Christ also went to his death without seeing his future but God raised him. He lived for eternity. By living for eternity he chose everyone for eternity. This is the great gift we can give to our brothers and sisters, living for eternity, willing to die without seeing our future, not to burden the future with our desires and ambitions. Jules Monchanin's witness is a great inspiration for us. May he continue to inspire us and bless our path. Today we remember the 107th birth Anniversary of Fr. 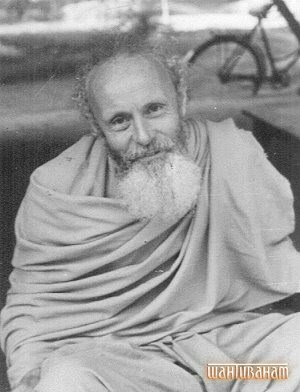 Henri Le Saux, swami Abhishikthananda. One aspect of his life that inspires me was his passion for Truth, for God and for the experience of oneness with God, the non-dual experience. We ask Swamiji to pray for us so that we may have the same passion for God, for Truth. I am now in France leading three days of retreat to a group of Christian meditation. Tomorrow 13th May we remember the 24th death Anniversary of Fr. Bede Griffiths. This is the day to thank God for the gift of Fr.Bede and the witness of his life. His passion for God or Truth was remarkable. He was interested in every field, philosophy, theology and science. His openness and simplicity of life were inspiring. He had a special Mission in his life. It was to unite the Christian faith with the perennial wisdom of Indian sages and science. He did this in a remarkable way. He was a real peace maker who worked hard to break down the barriers and bring unity. May his life inspire in us the passion for Truth, the passion for unity and the passion to become peace makers. Tomorrow (16th April 2017) we celebrate the feast of Easter-Resurrection of Jesus. This mystery has to be understood in two phases: Resurrection before physical death and Resurrection after physical death. 1 It is awakening to the infinite or eternity within us. This happened to Jesus at the moment of his baptism. He transcended the horizontal moment of time and entered into the realm of infinity and eternity. 2 it is realising our oneness with the infinite. Jesus said, the Father and I are one. 3. It is the transformation of our body into the body of God, into the vehicle of God. We see this in Jesus at his transfiguration. 4. It is to see the whole of creation as the manifestation of God. Wherever Jesus saw he saw the kingdom of God. 5. It is the transformation of our ordinary life into the divine life. These are all the experiences of resurrection before physical death. It is the sharing of our physical body in the life of God. Our body has the seed of eternity in it and finally it returns to eternity. This can be said as the salvation of the body. The resurrection after death is fulfillment of the resurrection before death. Unfortunately Christianity focused too much on the resurrection after death and completely neglected the Resurrection before death. Just as the crucifixion is a cosmic phenomenon Resurrection is also a cosmic phenomenon. It is the resurrection of the Truth. The Resurrection of Truth was there before Jesus Christ and it is there after Jesus Christ. Resurrection of Christ is the Resurrection of the fullness of Truth. It is the victory of Infinite over finite. It is the victory of fullness of Truth over relative truths. It is the victory of unity over divisions. It is the victory of peace over violence. It is the ultimate victory of wisdom over ignorance. The Resurrection of Jesus is the sign of infinite hope that one-day all divisions, all violence and all ignorance will come to an end. Unity, peace and wisdom will be ultimately victorious. satyameva jayate nanrtam, ultimately truth (unity) will be victorious, not untruth (divisions), declared the Upanishads sages. Only those who had the experience of Resurrection before death can declare this truth. Jesus Christ had this experience of Resurrection before death that gave him the strength to go through the darkness of suffering and death of his physical body. He is risen. This is also our infinite hope. Happy Easter. Let us have this infinite hope in spite of dark clouds surrounding us. The infinite is more powerful than the finite. The finite has a beginning and will come to an end. The infinite has no beginning and so has no end. The Resurrection of Jesus is an invitation to us to awaken to the eternity within. Let us awaken to the infinite life within. Those who build their houses on the finite are like those who build their houses on the sand. Those who build their houses on the infinite are like those who build their houses on the rock. The houses built on the sand/finite cannot withstand the storms of life. Only those who build their houses on a rock/ the infinite can withstand the storms of life. Easter is an invitation to build our houses on a rock, on the infinite. Today we commemorate the 122nd birth Anniversary of Fr. 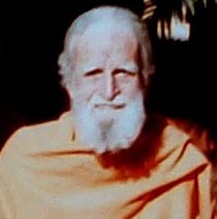 Jules Monchanin, one of the founders of Shantivanam. This is the day to thank God for the gift of Fr. Jules Monchanin. It is his vision and sacrifice that has given us the reason for our call and vision. Just like a seed dies to give birth to a tree without seeing it's fruits so also Fr. Jules Monchanin died without seeing the fruits. This is real sacrifice. A death that gives life. This sacrifice and death is the reflection of Jesus' sacrifice and death, who gave life by his death. May the life of Fr. Jules Monchanin inspire us to look into the future and offer our life for the future, for the unity of mankind. It signifies a lonely path and courageous path. May we have this courage to follow the path led by Fr. Jules Monchanin. His case for canonization is in the process and we seek his intercession for the ashram, and for all the oblates and friends. Fr. Jules Monchanin, pray for us. There are three spiritual practises recommended for the purification of our ego. Prayer, fasting and almsgiving. The Jews practised these three. But sometimes these spiritual practices instead of purifying our ego they may inflate our ego. Jesus was aware of this. So he exhorted his listeners to do these things secretly: to pray secretly, to fast without being known by others, and to do almsgiving so that the left hand does not know what the right hand is doing. The season of lent is meant to purify our ego. It is surrendering our ego to God so that our life becomes God's life and our actions become God's actions. External penitential actions may be good and necessary but if they do not lead us to the purification of our ego then they become only external show. Real prayer, real fasting and real almsgiving is when we say: not my will but God's will be done. Tomorrow we remember the birth anniversary of our beloved master Fr.Bede. We are very greatfull to God for the gift of Fr.Bede. Whenever Fr.Bede celebrated his birthday he always spoke of the founders of the ashram, Fr.Jules Monchanin and Fr.Le Saux. For me these three are the symbols of three wise men who came to see the child Jesus, the eternal truth, manifesting in the flesh. It is said that these three wise men came from the East. Now the reverse happened, three wise men came from the west, to find the eternal truth, the Child Jesus. They needed to travel to the East to rediscover Christ, the peace maker. East is the symbol of the origin, the source, the eternal. Blessed are the peace makers, for they shall be called the children of God. The three founders of the ashram were peace makers. They tried to break down the barriers and create one God, one creation and one humanity and thus they became the followers of Christ. May we also follow their path and make journey to the spiritual East, not geographical East, to encounter Jesus, the prince of peace. The message of Christmas is the message of peace. May this Christmas help us to encounter Jesus, the peace maker, so that we also become instruments of peace in this troubled world. Today we remember the 42nd death anniversary of Swami Abhishikthananda. We express our gratitude to him for responding to the call of God generously and sacrificing everything for it. He manifests the spirit of Abraham, when asked by God to leave everything and go to the place which he will show him, who left everything with infinite faith and trust and followed the voice of God. Just as Abraham lived in tents ( a temporary settlement) so also Swami Abhishikthananda lived in tents. May we all have the same spirit of generosity and courage to respond to the call of God, at least internally if not externally. May Swami Abhishikthananda bless us from above and guide our path. "We have received this month our electricity bills and we can say that 70% of our charges have come down. The rest is for motors we use, to cut fodder for the cows, to pump biogas waste and to cut agricultural waste, which runs on three phase current. We are very pleased with the results and hope some more comes down in the next bills as we are still learning to work on it. 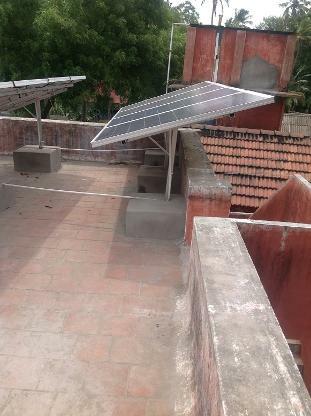 In July our bills were: 18,036 rupees( solar panel was not installed). In November the bills are. : 7,860 rupees." Unless a grain of wheat falls to the ground and dies it remains alone but when it dies it gives a mighty harvest. A seed does not see its fruits. It sacrifices its future completely so that the future lives for eternity. The life of Monchanin is life of sacrifice. A sacrifice that does not see its fruits. The community of Shantivanam is the fruit of Monchanin's sacrifice. I am sure he is looking at it from heaven. The community of Shantivanam is very greatful to God for the gift of Monchanin. We ask the intercession of Monchanin to ask God to bless our community, our oblates and friends. May the spirit of Monchanin guide our path to God. Peace be with you. I hope you are fine. We have received electricity bills. Usually the bills are given for two months. We have used solar energy only for a month. Only in the next bills we will have clear picture. 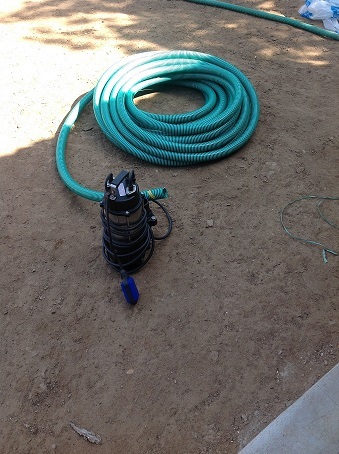 energy for them: for example motor to pump water, motor to cut grass, need regular electricity. But 80% is a great success. After two months we will get a clear picture. Peace be with you. I am in Netherlands now. I go to France on 21st. From there I go Germany on 26th. 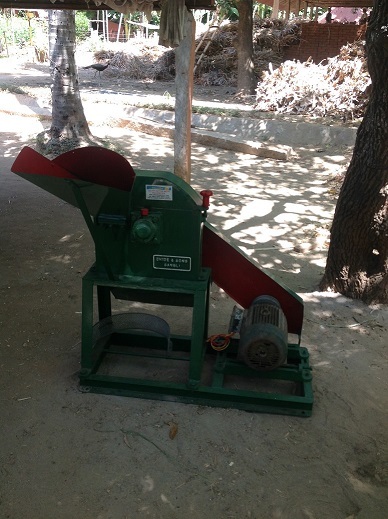 We have more good news from Shantivanam - Brother Martin has shared some photos of a gift offered by Michael Giddings of a chaff cutter and submersible pump. I have just returned from France. 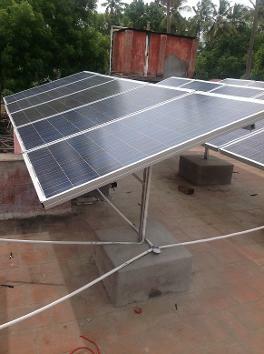 Solar panel work is almost finished. Today they are testing. Here I send you some photos. 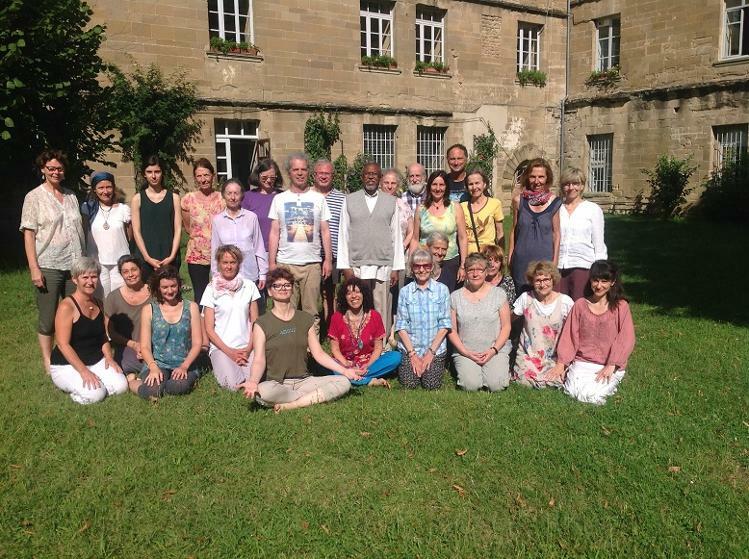 I send you the photo of the first session in St.Antione L'abbey, France. The second session begins tomorrow. After this I return to India. peace be with you. 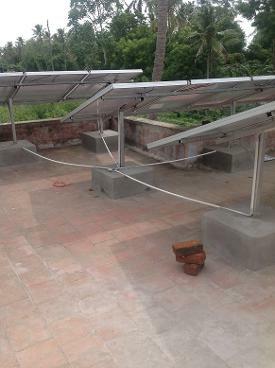 We had presented the solar project for the ashram requesting generous contributions. A miracle happened before it started. Mrs. Aruna from Madhyapradesh, India, has offered to fund the entire project which would come around 15,000 US$. She is in touch with the project executors and the work might begin around 10th of July. God's ways are marvellous. Still we need to do some other improving works, like construction of the bath rooms to the old guest house. So anyone like to contribute for the ashram, we welcome wholeheartedly. Greetings on the feast of St.Romuald, the founder of our Camaldolese congregation. We ask your prayers for the community of Shantivanam. Br.Dorothick will make his final commitment to the monastic life on 26th of this month and Br.Martin and Br.Sigo also make this simple profession on the same day. It is a blessing to the community and we ask you to share in our joy. I also like to place before you our latest project to the ashram. Our electricity expenses are going high as we are charged with commercial rates and periodical electricity cut is a continuous nuisance. So we have decided to go for green and pure energy and contribute our little mite to reduce ecological pollution. This is also in addition to the biological farming we have introduced producing our own vermi compost. 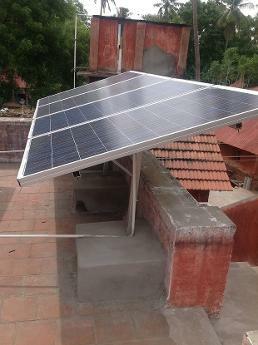 We need to put up solar panels in two places in two places: in the ashram and in the formation house. We will be grateful if any one would like to support this project either from his own or her own resources or suggesting or recommending to the individuals or institutions where some help possible. We spend around US$ 2500.00 for year for electricity charges. If solar panels are installed this amount can go for our charitable works like children's education, elderly care and medical care to the poor. 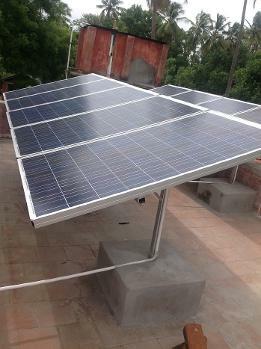 Hence your support for the solar panels is indeed support to the poor and the needy. Your support in whatever way possible will be greatly appreciated by the community of Shantivanam..
How to explain the concept of God as Trinity to non-Christians? I do not wish to become a super God by defining what Trinity is but see it in a practical way. The Christian concept is that God is Love. Love is Unity. so God is Unity. This Unity unfolds the creation. The dualities that we see in the world are unfoldment of Unity. Another Christian concept is that Love is relationship. Human life is relationship. It is in relationships that we share God and we receive God. It means that we need to see God in the other. It is God in us loving God in the others. It is God in us giving to God in the others. It is God in us receiving God in the others. It means a husband sees God in his wife and a wife sees God in her husband (it may be the most difficult one).The parents see God in their children and the children see God in their parents. A student sees God in the teacher and the teacher sees God in the student. It means our relationships are not a business but become sacred. We do not use others as objects to satisfy us or enrich us materially. Everyone and everything is the manifestation of God. It is God loving God. We are all one in essence and three in appearance, in relationships. Unity and Trinity go together. In every relationship there are three: the husband-wife and the love between them which is the binding principle. The lover, the beloved and the love between them. The static, the dynamic and the link between them. This is the message I get when I meditate on the concept of Trinity. This is also the message I get from the Eucharist. It is seeing the finite bread and wine as the body and blood of God and sharing with each other in relationships. It is the love of God manifesting in relationships, in the love of neighbour. It is not theoretical Trinity but practical Trinity, living each moment of our life. This way of living I describe as 'unfolding', in opposition to becoming. In Unfolding every action comes from our unity with God and with one another. In becoming, our actions come from our fragmented identity or ego as a means of filling our emptiness. In unfolding, our actions come from our fullness, from our image and likeness of God. In becoming our life is like a barren fig tree. In unfolding our life is 'to be fruitful and multiply'. It is the fruitfulness and multiplication of divine attributes in relationships. Every encounter with the other is a Trinitarian experience. The Feast of Corpus Christi... The feast of the body and blood of Christ, the Eucharist. The last supper is the most profound and original ritual that Jesus had left. The Eucharistic celebration of Jesus reveals the essence of Jesus' life and teaching. Jesus proclaimed the good news of the kingdom of God. The kingdom of God reveals who we are and how we have to live our lives in this world of time and space. The essence of the kingdom of God is to transform our life into the life of God and transform our actions into actions of God, our children into the children of God. The kingdom of God is the fullness of the love of God and the fullness of the love of neighbour. When Jesus said, 'the Father and I are one' it is the fullness of the love of God. When Jesus said, 'whatever you do to the least of my brothers and sisters that you do unto me' is the fullness of the love of neighbour. The kingdom of God is the realization of oneness with God and oneness with the whole of humanity and creation and relating with God and with the creation with that awareness. Jesus Christ lived his life with that awareness. His life was the life of the kingdom of God. When he realized that his death was near, he celebrated the last supper, the Eucharist with his disciples. The last supper was the ritualistic presentation of his life and his message and an invitation to live that life and that message. People might forget the words but if a ritual is done it is very difficult to forget. The last supper of Jesus reveals that we need to elevate our consciousness to the level of the divine. This elevation transforms our finite life into the body and blood of God, into the manifestation of God. The whole of creation is seen as the body and blood of God. Whatever we give to others will be the body of God and whatever we receive from others will be the body and blood of God or Christ. The bread and the wine are the symbols of finite reality. By elevating them we transform them into the body and blood of Christ. The finite is seen as the manifestation of the infinite. In reality it is the transformation of our consciousness that sees the whole of creation as the body and blood of God, as the manifestation of God. Jesus took the bread and wine and gave to his disciples: this is my body and blood, take and eat. By transforming his life, Jesus Christ has become the body and blood of God. The body of Christ is nothing but the body of God, the blood of Christ is nothing but the blood of God, they are the manifestations of God. This act of Jesus manifests the love of neighbour. Hence the essence of the ritual of the last supper is nothing but the fullness of the love of God and the fullness of the love of neighbour. The love God needs to be manifested in the love of neighbour. In the fullness of the love of God our relationships with our neighbours become sacred. Every encounter with the other, every relationship with the other becomes an Eucharistic celebration. Whatever we give to the other is the body of God or Christ and whatever we receive from others is the body of God or Christ. Jesus Christ said, unless you eat my body and drink my blood you will have no life in you. To eat the body of Christ and to drink the blood of Christ is to enter into the consciousness of Jesus. It is to enter into the fullness of the love of God and the fullness of the love neighbour. It is to transform our life into the life God of life, our actions into actions of God. The last supper is the audio-visual presentation of the life of Jesus, his message and his invitation. The whole life of Jesus was the continuous Eucharistic celebration, the fullness of the love of God manifesting in the fullness of the love of neighbour. He invited his disciples and thus the whole of humanity, to do the same thing: do this in memory of me. It is not meant to be a mechanical repetition but personal realization. It is an invitation to grow into the non-dualistic love of God and non-dualistic love of neighbour. It is to transform our life into the life of God, our actions into actions of God, into the body and blood of God and share that body and blood with others and receive the body and blood of God from others. It is to transform our life into sacred encounters with everyone and everything. It is to transform our life into a continuous Eucharistic celebration, twenty four hours of the day. Today, 13th.May, we commemorate the 23rd.death anniversary of our beloved Guruji Fr.Bede. His passion for Truth, his passion to build bridges has been a great opening of the door for thousands of people to go beyond the confines of belief systems and discover the liberating truth in the cave of our hearts. It is deeply touching to see how many people found solace in his vision. As I was giving a talk in the Won Buddist centre, Philadelphia, a lady came to me after the talk, showed the book of Fr.Bede, 'the return to the centre' and told me 'this book has transformed my life. It brought me out of my spiritual crisis'. As I was giving a talk in New York city, a person who came to my talk, showed to all the participants, the book of Fr.Bede 'the Marriage of East and West' and said how it transfomed his life'. As I was in another inter-religious meeting, two people spoke to me about the group that wants to continue the tradition of sannyasa in the tradition Fr.Bede. It shows how the seeds sown by Fr.Bede are bearing fruits. Let us thank God for the gift of Fr.Bede and the witness he has given us. May we share the inspiration we have received wherever it is possible to make people free. We have entered into the Holy Week. We meditate deeply on the crucifixion, the death and the resurrection of Jesus Christ. This historical event is also the cosmic event. It is the crucifixion of Truth and the Resurrection of Truth. It was there before Jesus' crucifixion and it continues to be after his crucifixion. There are two ways we can crucify the Truth: one is thinking that our relative truth is the fullness of Truth and refusing to grow into the fullness of Truth. Second is reducing the fullness of Truth into the tombs of relative systems of truth. The reason for the crucifixion of Jesus was the refusal on the part of the religious leaders of his tradition to grow into fullness of Truth. On the part of Jesus it was refusal to bring down the fullness of Truth into fragmented belief systems.But Truth cannot be crucified. It cannot be placed into the tombs of belief structures. It will rise. It will be always victorious. The resurrection of Jesus is the testimony to the eternal victory of the fullness of Truth over the tombs of relative truths. This should keep us always alert so that we do not crucify the Truth. We do not refuse to grow but willing to grow into the fullness of Truth. We do not confine Truth into the fragmented tombs of relative truths that divide humanity. The fullness of Truth is Unity. All the artificial divisions in the name of relative truths will come to an end and Unity will ultimately prevail. Satyameva jayate, nanrtam; Truth or Unity will be always victorious, not divisions, declared an Upanishads sage. The Resurrection of Jesus is the testimony to the victory of Unity over the Divisions. This is our infinite hope. Rejoice, Alleluia, for Truth is risen and always will do so. Let us not imprison ourselves into the tombs of relative truths. Let us also rise from the tombs of divisions into the freedom of Unity. Greetings of peace and joy from Br.Martin, from Shantivanam. I hope you are fine, hale and healthy. The community of Shantivanam ashram comes to you with a request. The present need of the ashram necessitated us to initiate a project called ‘Friends of Shantivanam’. We are trying to gather some friends who commit to support the mission of the ashram spiritually and economically. Please read the following and see how you wish to respond. The ashram community will be grateful for your support. The community at Shantivanam would like to invite you to become a friend of the ashram. This is a friendship that will be cultivated around the spiritual vision and mission of the ashram with benefits extending to the many poor and needy associated with us directly or indirectly, whether working with us or simply because of living in the extended vicinity of our neighborhood. For our ashram’s mission is simultaneously spiritual and social, encompassing 100% love of God and 100% love of neighbor. In addition to a deep contemplative life that we live daily ourselves, we are committed to providing a conducive atmosphere for anyone who wishes to deepen their spiritual journey, and, quite importantly, we are engaged in inter-religious dialog, a vocation that we inherited from our founders Jules Monchanin and Henri Le Saux and Bede Griffiths. And we, like them, are inspired by Jesus himself, who said, “Blessed are the peace makers for they shall be called the children of God”. Our world, as you know, is in conflict largely because of the lack of understanding and harmony between religions. Together, we can make a difference in our world today! Jules Monchanin’s mission was that the ashram be “fully Christian and fully Indian”. Since we cannot separate the spirituality from the culture of India, we are both Christian and Hindu in the deepest sense. This is no simple witness, but one that challenges us every day. Swami Abhishikthananda focused on us bearing witness to the “The Hindu -Christian Meeting Point”. This entails living the mystical depth of two traditions simultaneously. And our dear Fr. Bede Griffiths not only wrote extensively on “The Marriage of East and West”, he exemplified this harmony in every facet of his life urging us to follow suit. Ours is a tall order following in the footsteps of three powerful founders. Additionally, we are grounded in the inspiration of the Gospel as well as the vision of the Upanishads. Our founders worked tirelessly to build bridges among the great world religions and we feel compelled to continue this mission. They were peace makers through which they became children of God, consciously. Their lives inspire us to pursue the path of peace makers and to consciously become children of God, too. We want to invite you to join us in this mission, to be peacemakers in the world, fostering better understanding among the world’s religions while living out of our own mystical depth and peace. We are asking you to make a commitment unit of 30 Euros or US$40 or 25 Pounds a year (2.5 Euros,$3.5 a month and 2 pounds a month)! Imagine your annual 30 Euros or US$40 or 25 Pounds a year supporting everything we’ve stated: our inter-religious mission, thousands of children, the infirm and elderly, building houses in the villages, and so much more! The reason we solicit your friendship and support is because the cost of living here in India is escalating with inflation. The ashram’s budget for all its needs are about 30,000 Euros, US$40,000 25,000 Pounds a year which we can easily achieve with the support of 1000 friends such as yourself. This will give us the stability to focus on our mission 100% and you can be a vital part of it! We have factored one unit of contribution as 30 Euros or $40 or 25 Pounds as the basic commitment. If someone likes to contribute more than one unit, it would be deeply appreciated. 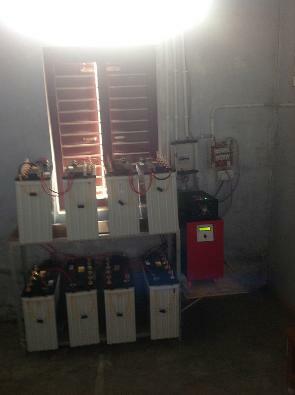 2 Units is 60 Euros, or US$80 or 50 Pounds per year. 50 Units is 1500 Euros or US$2000 or 1250 Pounds per year. Your commitment can be fulfilled at any time during the year, or distributed over the course of a year, or any time you feel inclined to do so. It is best to wire transfer money into our account or send us a check in the mail. Wire transfers are preferred as it is the safest and fastest and easiest method for us. Checks take long to clear or get lost in the mail. Those who belong to U.K. can donate To Bede Griffiths Charitable Trust in U.K.
You can also gift aid to the BGCT. They will transfer the money to the ashram account. Address: Thannirpalli, Marudur Post, Kulithalai Taluk, Karur Dt. Tamilnadu- 639107. Check should be made to Saccidananda Ashram. Please fill out the attached commitment form accordingly. And welcome to a lifetime of spiritual friendship with the ashram. I want to be a friend of Shantivanam, and I pledge to contribute _____ Euros/Dollars/Pounds per month/ per year as part of the expression of that commitment, knowing that this money goes towards supporting the work and inter-faith mission of Shantivanam Ashram together with all of its varied social projects. I also commit to living a deeply spiritual life, as best as I can, and to fostering better understanding and peace between spiritual traditions in whatever situation I find myself able to do so, serving as a conscious peacemaker in our divided world. Would you like to be a friend of Shantivanam? A friend of Shantivanam is one who feels at home with its spiritual vision and wants to keep in touch with the ashram and collaborate with the ashram’s mission. 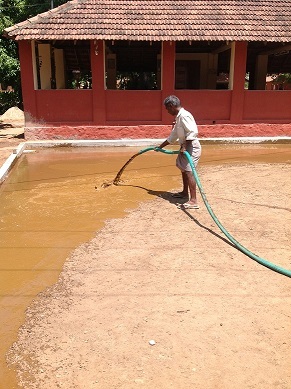 The ashram’s mission is two dimensional: spiritual and social, love of God and love of neighbor. UK pounds 24 per year/ 2 pounds a month. If someone likes to contribute less or more they are most welcome to do so. It can be paid once in 6 months or once a year. Those who live in UK can donate to Bede Griffiths Charitable Trust. Those who are in Schengen countries can donate to Les Chemins de Shanti in France. We can suggest other possibilities also. I want to be a friend of Shantivanam and I commit to contribute ……. Euros /Pounds/ dollars per a month/ year as a token of my commitment. I wish you all happy new year 2015. Let us thank the Infinite for the year 2014. Let us accept all the positive and the negative aspects of the past year. Let us also forgive those who have caused difficulties to us and also ask forgiveness if we have done any harm to others. Let us pray to the almighty for a world where there will be peace, equality, freedom and respect for the human dignity. The feast of Christmas reveals the ultimate destiny of our spiritual evolution. Our spiritual evolution can be described as a journey from mine to ours and from ours to God. It is to transform our life into the life of God, our actions into actions of God and our children into children of God. The birth of creation and our own individual birth is like a turtle that comes out of the infinite ocean and lays eggs on the beach. When the eggs are hatched the baby turtles rush towards the sea. God is like the mother turtle and primordial matter and individual souls are the beach on which God lays her eggs. There are two important moments in the story of Christmas: conception and giving birth. In order to give birth to God we need to receive the seed of God. At the time of annunciation Mary received the seed of God and gave birth to the child of God. Mary and Joseph said, 'this child is not ours but God's'. With this a revolution began in this world. It is the beginning of new heaven and the new earth. The first annunciation and conception took place at the time of Big Bang. The primordial matter which was a like a virgin, unconditioned by the past, received the seed of God and conception took place. This fertilized seed of God evolved until the birth of God took place in the enlightened people including Jesus. Jesus Christ, at the moment of his baptism, gave birth to God and finally realized being one with God. We can say that the period from the moment of big bang until the birth of God in the human consciousness is the period of advent. The farmer sows the seeds, nourishes them and waits for the harvest. From the time of sowing to the time harvest is the period of advent. We reap what we sow. If we sow the seed of God then we reap the fruits of God. The time of annunciation is the time of sowing. The moment of Christmas is the time of reaping. There are two parents who facilitate this birth of God: physical parents and religious parents. Physical parents become virgin parents if they have the wisdom to say that the child conceived does not belong to them but to God. They are only foster parents to God's children. Religious parents(religions) become virgin parents if they have the wisdom to say that their followers do not belong to them but to God. Religions are only foster parents to God 's children. If both physical parents and religious parents accept this vocation only then we can celebrate Christmas.Christmas also is not limited to children but it also extends to our actions. When we we have the wisdom to say that our actions are not our actions but God'd actions then every action of ours becomes God's action or God's child. Every action is the celebration of Christmas. Jesus Christ said' the works which I do are not my own but God who dwells in me does his works. He was celebrating Christmas each moment of his life. Jesus Christ invites every one to make each moment a moment of Christmas instead of commemorating once a year. a parable on The Virgin Mothers of God. Tomorrow, the 7th December, we commemorate the 41st death anniversary of Swami Abhishikthananda. The community of Shantivanam is ever grateful to the vision, the sacrifice, the courage of Swamiji for taking the untrodden path. His life has been a great inspiration for those who wish to make their journey to the further shore. He was a great seeker of truth and the lover of truth. He did not admire the ocean of truth from a distance but jumped into it and swam in it. His encounter with the vedic wisdom helped him to discover the universal Jesus Christ and inclusive Jesus Christ. He liberated Christ from the clutches of Christianity and opened the possibility of a deeper Hindu-Christian Dialogue. Christanity has still to digest this new vision of Christ. 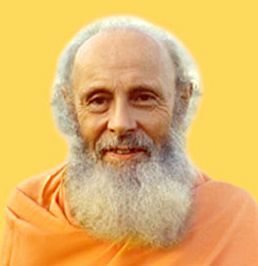 As Christianity is going through a deep crisis in Europe, the vision proposed by the swamiji can be a solution to come out of its crisis and move into the future with an inclusive and liberating vision of Christ and Christianity. May Swamiji intercede for us so that we open our hearts and minds to this new vision of Christ and Christianity.